Until '300' I was most comfortable doing 'reality'- making stuff that wasn't there look real in a movie. '300' changed all that- I am still perfectly happy with reality but I have grown fond of complete fabrication! For those who don't know, '300' is the cinematic retelling of Frank Miller's comic about the Battle of Thermopylae, in which 300 Spartan soldiers held Xerxes' masses at bay for three days before being annihilated by their Persian enemy. This all happened in August of 480 BC on the Mediterranean coast. '300' was shot almost entirely on bluescreen, in Montreal, in the dead of winter, so at this point I'm pretty fearless. And I've learned to speak French. Here is an article on VFXWorld. Here is an article on CG Society. SolaceInCinema has a really cool comparison to between screen shots of the trailer and some panels in Frank Millers graphic novel. We did design the shots to look like the comic, but it's really entertaining to see so many examples in one place. Check it out here. There is a flattering prerelease review here. How Stuff Works attempts to tell how it worked. On March 8, 2007, Zack Snyder, Larry Fong and I hosted a discussion about 300 at the Apple Store in Santa Monica. As a total Mac zealot this was pretty exciting for me. 350 people came, which is apparently a record! (Later busted by DEADMAU5, I’m sure!) The next day I got recognized on the bus- the driver had been at the Apple Store presentation. There is a nice article in the New York Times. Too bad the guy who did the final review hates the movie so much. Here's a review that I found after our preview screening on November 16th. Studio Daily talks to Grant Freckelton! As of February 24, 2008, 300 had made $210 million in the US and 457 MILLION DOLLARS worldwide. Wow. There are about 1500 cuts in the film. There are 1306 visual effects shots in the film. New Deal Studios in Los Angeles shot some insert footage. 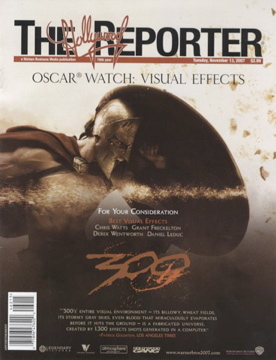 Ten visual effects vendors contributed to the film, spread over three continents. I've learned a bit about Quebec visual effects vendors on 300, if you're planning on doing any visual effects work in Montreal, I have plenty of interesting things to tell you. There are some real gems in Montreal, and then... there was Meteor. We had a miserable time at Meteor, more due in incompetent management than anything else. If you are talking to any people who claim to have been part of Meteor’s management, you are probably talking to the wrong person to work on your project. That said, Meteor had many fine artists, a few of whom contributed greatly to the success of 300. There are a few studios in Montreal and elsewhere that are inexplicably featuring work from 300 on their showreels. There is a company called Lumiere in Montreal that did not exist when 300 was released, and they had nothing to do with the film. The only conceivable connection is that the president of Lumiere worked at Meteor in Montreal (see above) Also, Fake Studios in Montreal has posted clips from 300 that were actually done by Animal Logic. And there are TWO vfx companies called Scanline- and they BOTH claim to have worked on 300. Scanline of Munich (and now LA) did in fact make a fantastic contribution to the film, the 'other' Scanline had nothing to do with 300. The digital intermediate was done at Company 3 in Santa Monica. We used bluescreen 90% of the time, and greenscreen for 10%. We chose blue because it better matched out lighting paradigm (green would have been too bright) and because red garments (like spartan capes) key better when shot over blue. There was one day of location shooting, which was for the horses that were shot for the 'approaching sparta' scene. Post production took almost a year. The film was edited on an Avid, with an HD cut also maintained in Final Cut Pro. The 3D was made using Maya, XSI, and Lightwave. The 2D composites were made with Shake, Inferno, Digital Fusion, and Combustion. We prefer OS X, but some portions of the movie were made under Linux and a tiny bit was made under Windows. Asset management was handled by custom software written in the Panorama development environment, made by Provue. Color management was handled by Truelight software. The film was scanned on a northlight scanner and was recorded on the arrilaser. We did our 2K viewing and film recording, and preliminary DI testing at Warner Bros Motion Picture Imaging. We used a Baselight. Most of the film was shot at high speed, between 50 and 150fps. Normal film is at 24fps. This was a key reason why we shot the movie on film. The film was transferred to HD SR tape and quicktime, and HD quicktimes were the basis for the HD preview cuts. The working resolution for the film was 2K (2048x1556), at a working aspect ratio of 2.11 and a projected aspect ratio of 2.35. There was an IMAX version of 300 at compatible locations that support R-rated movies. It was the highest grossing IMAX feature ever. But I am sure Batman beat us. Go to this page to see some of the DVD Extras. We have a trailer on youtube. It's a great trailer, and the were just a couple of temps left to finish when this trailer was completed. Of course, art is never completed, only abandoned, but I'm pretty happy wth this one. There's a high definition trailer available at Apple, click here.